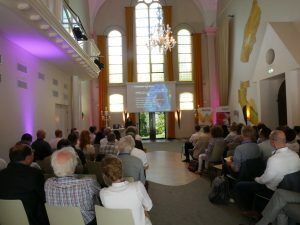 On May 15th, MinacNed, hDMT and HollandBIO MinacNed jointly organized the network meeting “Accelerating drug development using organ- & lab-on-a-chip technology”, mingling entrepreneurs with a background in biology and engineering. After three keynotes, two pitches and networking, the meeting’s take-home message was crystal clear: the fast-emerging field of organ- and lab-on-a-chip is of great value to improve the drug development trajectory, benefitting patients and society alike. The meeting’s first keynote was brought by Claudia Beaurivage, who works as an associate scientist at Galapagos. The clinical-stage company has a growing pipeline, including its lead product filgotinib. Claudia’s research project aims to discover and validate new drug targets for Inflammatory Bowel Disease using 2D and 3D models like organoids and transwell systems. She established a microfluidic model using primary human material, offering several opportunities for readouts and generating lots of data per experiment. Although organ-on-a-chip technology can’t mimic a full human body (yet), it holds plenty of advantages compared to other models, both in vivo and in vitro. In addition, the application of the technology is not limited to the drug discovery process, but includes preclinical studies too. Arie Reijerkerk, lead scientist at Ncardia, was the meeting’s second keynote speaker. Arie stressed the high-cost and high-risk nature of drug development. The lack of predictive preclinical models for efficacy and safety testing is one of the reasons for the low success rates. Based on human-induced pluripotent stem cells (hiPSCs), Ncardia offers a predictive and translational in vitro model, plus assays for efficacy screening. With the technology, virtually any human cell type can be generated from hiPSCs, resulting in a perfect model for efficacy screening studies. The company’s portfolio is most advanced in manufacturing beating cardiomyocytes. Common side effects of drugs in the cardiovascular space are caused by problems in ion-channels. Ncardia’s in vitro model is able to predict and study these types of side effects, resulting in an improved and faster way of drug development. Last but not least, keynote Paul Vulto explained why Mimetas’ human tissue models contributes to better therapies. Mimetas brought cell culturing and microfluidic assays to a next level, resulting in the introduction of the company’s range of OrganoPlate-based models. Using 3D-imaging techniques, the plates enable the analysis of both healthy and diseased phenotypes. Mimetas already collaborates with big pharma and biotechs around the world, but Paul’s ultimate dream is that the OrganoPlate is used by every single lab in the world. In addition to the keynote presentations, the program included two technology pitches, by LioniX International, a global provider of customized, integrated photonic-based, microsystem solutions and by Bronkhorst, leader in low flow fluidics handling technology. The inspiring afternoon made it crystal clear: organ- and lab-on-a-chip technology will accelerate the development of medicines, leading to better, safer and more cost-effective medicines. While enjoying a cold drink, the attendees engaged in animated discussions. A fruitful first encounter of entrepreneurs in biotech and engineering.